Sybrina Fulton, mother of Trayvon Martin; Ronald S. Sullivan, Jr., Clinical Professor of Law, Director of the Criminal Justice Institute, Harvard Law School; David LaBahn, Association of Prosecuting Attorneys president and CEO; Ilya Shapiro, Senior Fellow in Constitutional Studies at Cato Institute; John R. Lott, Jr., president, Crime Prevention Research Center of Swarthmore, Pa.; and Lucia McBath of Atlanta, Ga.; are sworn in on Capitol Hill in Washington, Tuesday, Oct. 29., prior to testifying before a Senate Judiciary subcommittee hearing on so-called "stand your ground laws." A committee of Florida lawmakers rejected a proposal to repeal the ''stand your ground'' self-defense law Thursday, following an hours-long hearing. The Florida House of Representatives Criminal Justice Subcommittee held a five-hour hearing starting at 3 p.m. to vote on a bill repealing the law granting individuals to use deadly force when they believe their life is in jeopardy. "Today, our state is a safer place and has the lowest crime rate in 42 years," Rep. Marti Coley, a Marianna Republican, said, according to the Tampa Bay Times. "Florida's 'stand your ground' law is solid. It's good and should not be changed." The bill, sponsored by Rep. Alan Williams (D-Tallahassee), would have specifically repealed the statute allowing individuals the right to “stand their ground” and use deadly force against another instead of retreating under fear of death or great bodily harm. The hearing followed protests in July sparked by the acquittal of George Zimmerman for the shooting and death of Trayvon Martin. Protesters, many of whom were students calling themselves the “Dream Defenders,” held a 31-day sit-in at the Florida Capitol calling for Gov. Rick Scott to call a special session to debate the self-defense law. While the stand your ground” law did not play a role in Zimmerman being found not guilty by a jury, the law did delay police from arresting and charging Zimmerman in Martin’s death. While the governor refused the protesters' demands, House Speaker Will Weatherford agreed to a hearing on the law during the fall. Last month, two Florida mothers whose sons were shot to death, including Trayvon Martin's mother Sybrina Fulton, gave emotional testimony at a Florida Senate panel calling on states to alter their laws granting use of deadly force. At least 22 states currently have stand-your-ground laws. The House committee also considered a separate measure at the hearing involving deadly force -- eliminating punishment for defensively displaying a weapon and firing warning shots. 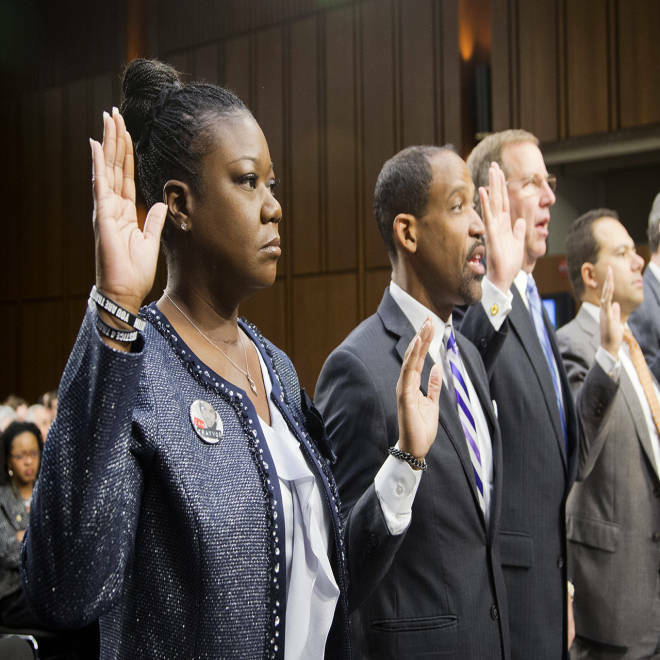 The panel approved the expansion of the ''stand your ground'' immunity to people who fire a warning shot. Under the measure, individuals are exempt from Florida’s mandatory minimum sentencing provisions for discharging a firearm when used only as a warning. The “warning shot” measure comes after Marissa Alexander was sentenced to 20 years in prison by the state’s mandatory sentencing law for firing a shot at a wall during an August 2010 fight with her husband in which she said she feared for her life. Alexander won a new trial following an appeal in September.